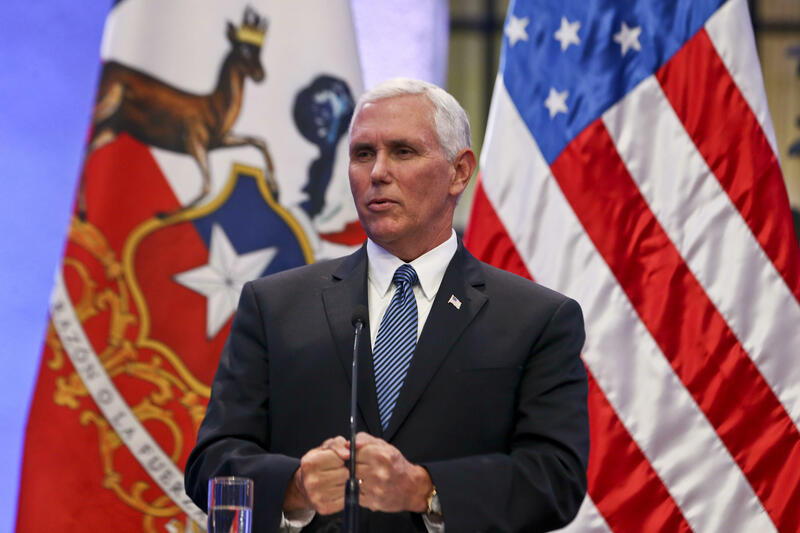 Vice President Pence will return to the United States early from his visit to South America, according to Pence's communications director Jarrod Agen. Pence will cut his trip short by one night in order to meet with President Trump and the National Security Team at Camp David on Friday. The group plans "to discuss the South Asia strategy," according to White House Press Secretary Sarah Huckabee Sanders. Pence was originally set to leave Panama Friday morning, but instead will leave at 8 p.m. Thursday evening, arriving back in the United States in the early morning. Pence is currently in Chile as part of his foreign visit, where he met with Chilean president Michelle Bachetel on Wednesday. In a briefing with reporters also on Wednesday, which marked his first live comments since Mr. Trump's divisive Charlottesville remarks Tuesday afternoon, Pence was reluctant to agree or disagree with the president that the violent events occurring over that weekend were to blame "on both sides." "What happened in Charlottesville was a tragedy," Pence said. "And the president has been clear on this tragedy and so have I," he said, not specifying whether he agreed with Mr. Trump. In his travels Tuesday, the vice president downplayed the possibility for U.S. military intervention in Venezuela at two separate speaking events in Argentina. "As President Trump said just a few days ago, we have many options for Venezuela," Pence said. "But the president also remains confident that working with all of our allies across Latin America, and across the wider world, that we can achieve a peaceable solution restoring democracy and ending the crisis facing the people of Venezuela. But it will take all of us to do it."